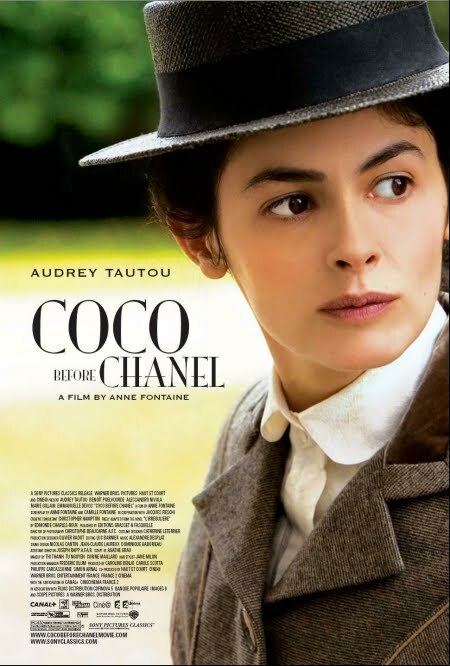 Being an avid lover of all things Chanel, I only saw it fitting that I watch the movie made about her life, Coco Before Chanel. I understood by the title that it wasn't going to entirely be about her fashion life, but it was definitely not what I expected it to be. Audrey Tautou stars as Gabrielle "Coco" Chanel in a movie entirely in French with English subtitles. That initially didn't bother me, as I speak French and I could obviously read the subtitles and watch the movie just fine. But as the movie went on, I realized it was completely about her dysfunctional upbringing and life experiences before she became a legitimate designer. I was under the impression it was about her rise as a fashion icon, and I was severely disappointed to see such an unflattering side of her. Don't get me wrong, she shows herself as a strong, independent, and ultimately successful woman in portions of the film, but the love webs she gets tangled into were a bit more than I was prepared for. In all fairness, I never read a synopsis of the movie before I decided to sit down and watch it, but I had extremely high hopes for the film that were dashed about halfway through. Tautou is a phenomenal actress in the film, but all in all, a disappointment that I wouldn't recommend.